Goat cheese making was never a hobby I anticipated taking an interest in during my younger years. In fact, I was nearly forty years old before I ever tasted goat cheese, and the first that I tasted was...my own! That's right--I never tasted goat cheese until I made it myself. It was love at first bite, and since I had my own goats, I made cheese regularly, mostly chevre, at least every other day during that first milking season. And it was eaten by the kids and me almost as soon as I made it. Since then, I've gained much more experience in both making and tasting different varieties, though I still think homemade cheese tastes better than any I've ever bought! As far as history is concerned, goat cheese making was likely one of the first processes developed by nomadic cultures for preserving food. The art and science of cheese making originated thousands of years ago as a way to preserve milk without refrigeration. Thought to have first been discovered "accidentally" when people ate the solid particles from curdled milk which had been stored in a bag fashioned from an animal stomach, cheese making has evolved into a highly precise methodology. In pre-modern times, and even now in non-industrialized cultures, goat herds were invaluable sources of food in the forms of milk and meat, and and also provided skins for clothing and shelter. Unlike cattle, goats can survive in arid, rocky regions with little forage, and are hardier and more resistant to diseases. Goat cheese was likely one of the first types of cheese made. And, just like the goat, goat cheese making has also survived! Though we technically no longer need cheese as a preservation method in industrialized countries with refrigeration, who would want to miss out on the wonderful experience of partaking of the variety of flavors and textures of cheeses that are both delicious by themselves and also complement many other foods so well? The original cheeses were something of a hit-and-miss proposition with trial and error forming the basis of the art of cheesemaking. The lessons learned were then passed down through generations of artisan cheesemakers. Goat cheese making today is still a skill; however, large-scale cheesemaking has evolved into a more scientific endeavor, with developed methods that specify measurements and processes that are relatively easy to duplicate. Commercially prepared cultures also enable cheesemakers to achieve reliable, consistent results. Read this article to learn more about the step-by-step process of cheese making. Starter cultures or acidifiers, such as vinegar and lemon juice, are used to cause the separation of the curds from the whey. The type of culture used affects the flavor and texture of the final cheese. Rennet is a coagulating substance that helps to produce firmer curds. Animal rennet usually comes from the stomachs of young calves, while vegetable rennet has a mold as its source of coagulating enzymes. Either is suitable for making goat cheese. I have used both, and could tell no difference in coagulating properties. Salt is mixed in with the curds (before pressing for hard cheeses), and is also used to make a brine for cheeses that are soaked to create a rind. Only non-iodized salt is used. Of course, the star ingredient you'll need for goat cheese making is goat milk. Goat milk is a beautiful, pure white color, compared to the off-white cream color of cow's milk. Therefore, goat cheese is also very white in appearance. Commercial goat cheeses often have coloring added to them (derived from annatto) to make them appear more creamy or yellow in color. Though many first-time cheesemakers learn the craft as a way to use extra milk from their dairy goats, it's not necessary to have your own herd to supply the milk for making cheese. If this is your first experience with goat milk, you will probably be surprised to find local goat milk suppliers more accessible than you thought, regardless of where you live. You just never had a reason to look for them before! The article, How to Find Goat Milk from Local Farms, will help you locate local sources for purchasing larger, more cost-efficient amounts of milk for goat cheese making. If you only intend to make occasional, small amounts of cheese, you can always just use goat milk from the grocery store. The end result will still be good; it will just cost more per batch to make. Two things you should keep in mind, however, are (1) you may need to add a small amount of calcium chloride to commercially processed milk to help it coagulate better, because the pasteurization process removes calcium, and (2) ultrapasteurized milk will not work for cheesemaking due to the alteration of the protein structure caused by the high temperatures. Finally, while you can use low-fat or no-fat milk for goat cheese making, there will be a corresponding decrease in the fullness of flavor of the cheese. I strongly recommend using whole milk for cheesemaking, as you can certainly find a less wholesome and tasty place to cut the fat from your diet elsewhere! Because goat cheese making involves culturing bacteria, the milk must be warmed to encourage the growth of the culture. The exact temperature required varies by culture, and is given in the detailed directions for making each kind of goat cheese. You can use raw or pasteurized milk for making cheese. Cheese purists often prefer raw milk cheeses because they contain natural enzymes and bacteria that enhance the flavor of the cheese, while others advocate pasteurization to ensure safety. Either option is considered equally safe if you are making a hard cheese that will be aged for 60 days or more. If you plan to make a soft, non-aged cheese from raw milk, however, you should ensure that the milk comes from a safe supply and has been handled properly. You may prefer to pasteurize the milk to be sure that the resulting cheese does not contain an abundance of pathogenic bacteria. Remember that cheesemaking involves conditions that encourage the growth of bacteria, so if your milk does not come from a clean supply, or has been improperly handled, you will be encouraging the growth of "bad" bacteria as well as the cheesemaking bacteria! You can easily pasteurize your milk at home, if needed. Since the proper temperature of the milk for making goat cheese is lower than the pasteurization temperature, I usually find it easier to pasteurize the milk, then simply let it cool to the proper temperature to begin making the cheese, rather than pasteurizing, then refrigerating, then re-heating later to make the cheese. If your milk is already pasteurized, or if you'll be using raw milk, you can simply heat it to the proper starting temperature. The different array of textures and flavors derived from goat cheese making are a mix of variables for heated temperature, type of culture, amount of rennet, type of milk and processing method. You'll find that, just as with most foods, homemade goat cheese tastes even better than what you can buy in the store and is also more economical. The proteins in milk consist of about 80% casein and 20% whey. Cheese, or curds, is produced by the casein portion of proteins, along with fats, and is obtained by separating the casein and liquid whey through an acidification process. Acidification can be accomplished either by the addition of an acid, such as vinegar or lemon juice, or through the use of bacteria. Bacteria convert the milk sugar lactose into lactic acid. This process reduces the lactose in ripened or aged cheeses to about 5% or less than that in milk, making these cheeses a viable alternative dairy product for those with lactose intolerance. One great thing about goat cheese making is that it doesn't require a lot of expensive supplies. In fact, you probably already have most of what you need, and you can easily obtain what you don't have. A great source for cheesemaking supplies is our affiliate, Cultures for Health. They have everything you will need for making cheese, from cultures and rennet to thermometers and cheesemaking books, as well as everything in between! And, if you're new to cheesemaking and unsure about exactly how to start, you can try one of the many cheesemaking kits available. The kits come with cheesemaking instructions and all supplies you'll need to make multiple batches of cheese. If you need another reason to try Cultures for Health, shipping is a low $3.99 flat rate to anywhere in the contiguous U.S.A.! An enamel pot with no chips can also be used, but aluminum is not appropriate, as the acidifying milk will react with it. A dairy thermometer, or a meat or candy thermometer will work fine. These can be as simple as a small plastic food storage box. You will also need rennet for most cheeses. It can be purchased in tablet or liquid form, and also is available from animal or vegetable sources. I find the liquid form easier to measure and work with. Finally, only non-iodized salt should be used, as iodine will cause the cheese to take on a greenish hue. If you'd like more information on making goat cheese, the following is a sample of the books you'll find at our affiliate, Cultures for Health. You may also enjoy their books on other healthy food topics. 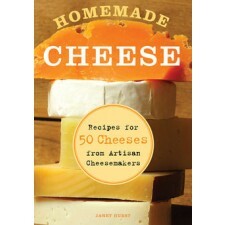 Includes 75 cheese recipes and 25 other dairy recipes. A must have for cheesemakers! Comprehensive cheese making information; incudes 50 recipes. 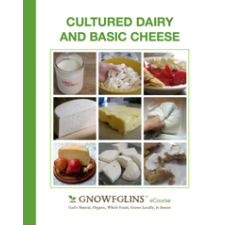 Learn to culture dairy products and make your own cheese with 18 easy to follow lessons. This comprehensive guide to farmstead cheese explains the diversity of cheeses. Discover the composition of milk (and its seasonal variations), starter cultures, and the chemistry of cheese. 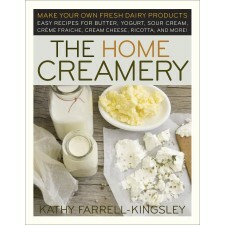 Make Your Own Fresh Dairy Products; Easy Recipes for Butter, Yogurt, Sour Cream, Creme Fraiche, Cream Cheese, Ricotta, and More! Recipes for 50 cheeses from Artisan Cheesemakers. Now that you know the basics of cheesemaking, visit our Goat Cheese Making Recipes to get started making your own goat cheese today. Want more articles on this topic? Tell us by taking our preference survey! Articles are updated frequently, so check back here for any new information related to goat cheese making!